Geocaching HQ: Thanks to everyone for attending! We all had a lot of fun! The main event takes place on Saturday, August 16, from 11am to 5pm, but the fun lasts all weekend with events like the Geocaching International Film Festival on Friday and the Washington State Geocaching Association’s Going APE Mega-Event on Sunday. Whether you love IPAs, Stouts, Porters or Lagers, Seattle is known for its delicious micro-brewed beers. Tour the tasty breweries of Seattle’s Ballard neighborhood. What time is it? Time to join Finn and Flame Princess from Cartoon Network's Adventure Time on a totally righteous Geocaching Adventure for Block Party. The first 1500 heroes to slay this quest will earn a totally lumping awesome Lumpy Space Princess medal! Oh my glob! 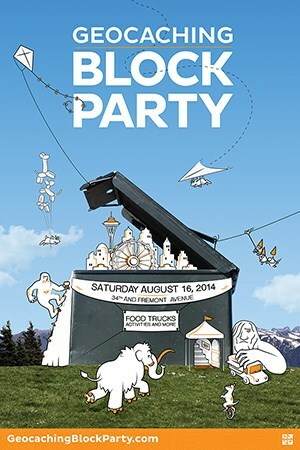 Geocaching can make you hungry, that’s why we have some of Seattle’s best food trucks joining us at Block Party, including: The Cheese Wizards, Chipstix, Plum Bistro, Auto Pompa Pizza, Street Hawk, Secret Sausage, and more. Gear up for your adventures and check out new products from Shop Geocaching as well as other geocaching and outdoor vendors. On Sunday, head to WSGA’s Going APE Mega-Event (GC4MHAQ). Aside from rubbing elbows with many of the Pacific Northwest’s geocachers, you’ll also be able to walk through the spooky 2-mile-long tunnel of light, find one of Washington’s oldest geocaches and visit the APE tribute geocache. Plus, you’ll also earn a unique souvenir for your geocaching profile. Enjoy “The Geocacher’s Guide to the Center of Our Universe.” Created for the Block Party by Geocaching HQ employees, this GeoTour takes you to our favorite spots in Seattle’s Fremont neighborhood. The caches are within walking distance and are available year-round. Unleash the kiddos (supervised, of course) on this adventure that will take them from one kid-friendly activity to the next. Not into all the touristy stuff? Take a look at the lesser-known gems that Seattle has to offer like Bruce Lee’s grave, Kurt Cobain’s favorite bench and more. If you’ve never been to Seattle, there are plenty of must-sees. Let this adventure guide you to all the best spots in the Emerald City. We’ll have a special spot for you to trade trackables with geocachers from all over the world. On Thursday night, come to the Hilliard’s Brewery in Ballard to enjoy a pint with a few Geocaching HQ employees.